As you all probably know by now, I am pretty much hooked on easy recipes that taste great and don’t take a lot of time, effort, or expensive ingredients to throw together. As a busy mom, I also want meals that can be made and frozen ahead of time to save time on hectic weeknights, especially as part of a Sunday Prep plan. My goal is to spend less time in the kitchen, not more, but I still want to be able to provide tasty meals that my family loves! 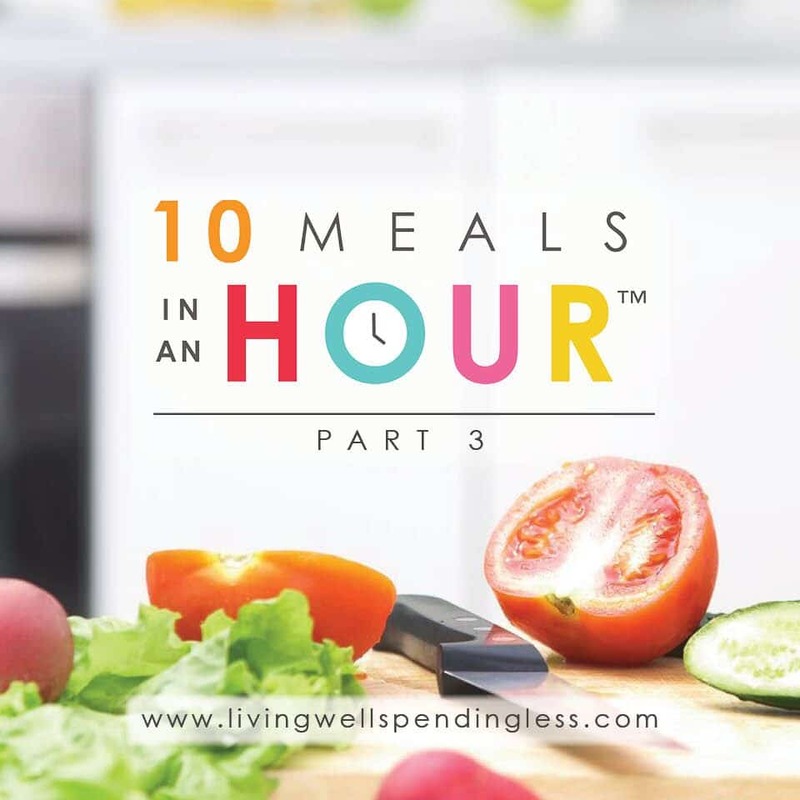 Over the past few months I have shared two different 10 Meals in an Hour™ plans, which have each included 5 great freezer recipes that can be prepared together in about sixty minutes. (You can find those plans plan 1 and plan 2.) They have both been a huge hit, not only with my own family, but with many of your families as well, and I’ve loved hearing how much you all are enjoying these tasty recipes. Today I am super excited to share this Comfort Foods Edition of 10 Freezer Meals in One Hour, which includes five delicious home-cooked meals that are perfect for fall. In this one post you will find everything you need to prep 10 awesome freezer meals in about an hour of hands-on time (not including grocery shopping.) Just think, in just one quick weekend session you could have almost two weeks worth of absolutely delicious, family-friendly meals all ready to go! Be sure to print the following pages before getting started. You can get them HERE. Prep Grandma’s Sloppy Joes using instructions found here. (Use only 1 cup or about half of the already chopped onion.) 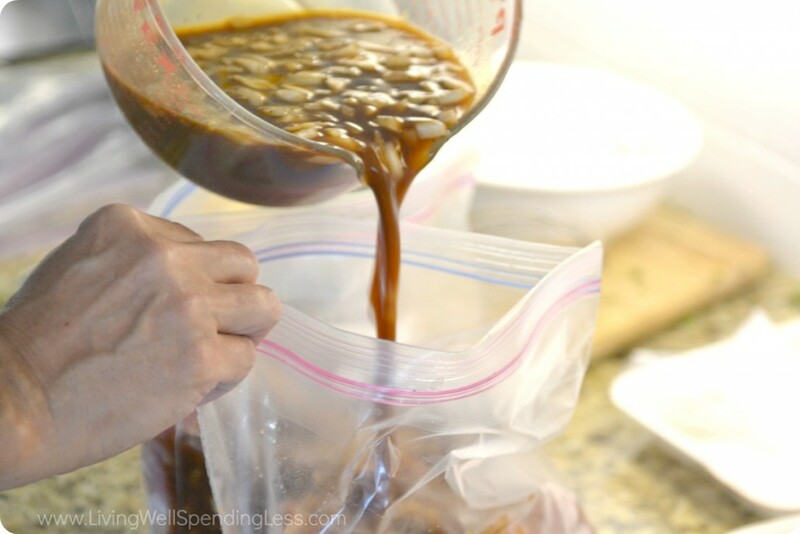 Divide mixture into 2 freezer bags, press out excess air, and seal well. Place bags in refrigerator. 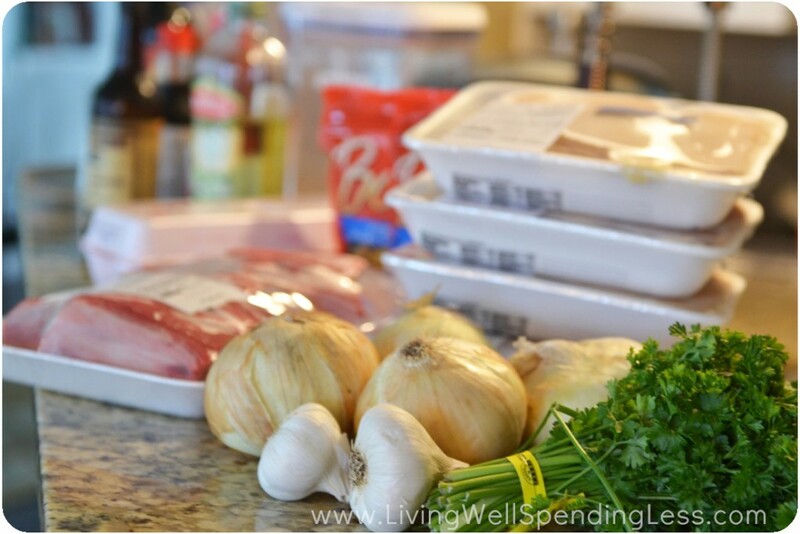 Prep Easy Freezer Pot Roast using instructions found here. Place meat into 2 freezer bags and cover with marinade, then press out excess air and seal well. Place bags in refrigerator. Prep Easy Slow Cooked Pork Tenderloin using instructions found here. (Use remaining chopped onion.) Place meat into 2 freezer bags and cover with marinade, then press out excess air and seal well. Place bags in refrigerator. Prep Easy Herb Roasted Chicken Breasts using instructions found here. Place chicken into 2 freezer bags and cover with marinade, then press out excess air and seal well. Place bags in refrigerator. Prep Tomato Parmesan Chicken using instructions found here. Place chicken into 2 freezer bags and cover with cream cheese mixture, then press out excess air and seal well. Place bags in refrigerator. 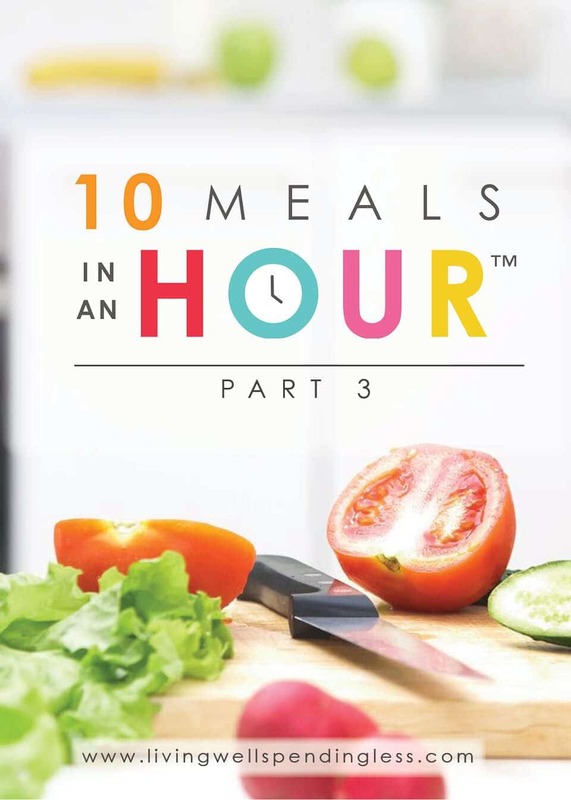 Have you tried making 10 meals in an hour yet? What tricks or tips can you share? This post was written on behalf of Frigidaire®. All opinions are mine. Frigidaire® has been designed to help families make the most of their time and space with high-performing, easy-to-use appliances with time-saving features. Their 2-in-1 Upright Freezer or Refrigerator offers simple organization and better storage with the flip of a switch. OH YOU MADE MORE RECIPES FOR US!!!! I am so thankful! I have loved your freezer meals as has my family. You are a rockstar! Thank you for helping us make meal planning easier. I know those printable take time but I truly appreciate it. These will be on my list for this coming week. P.S. I bought a chest freezer as I was running out of room. My husband has been wanting one for awhile and I was holding off. Now I needed it! This is SOOOOO AWESOME!!!!! We have already done the other 2 plans and LOVE them!! SO EXCITED to see another one!!!!!! Thank you!!!!! Such a lifesaver!!!!!!! I’m trying to get my boyfriend back on track and off the fast food. So these would be great to keep at his house. Thanks for sharing! What can I substitute for the red wine? I am not a wine person. I have been wanting to do this AND blog about it, but I just haven’t found the time. Maybe I can do it while watching football with the family on a Sunday. I know food costs vary region to region, but do you know how much you spent for these 10 meals? I’m trying to get a handle on what I spend each week at the grocery store. I know freezer cooking can save money in that the food is already prepared and it would stop me from ordering pizza at 5pm. But do you find it saves more money than just buying the ingredients and putting together fresh? Thanks for the help! Love your website! Why is the can of chicken gumbo soup and tomato rice soup on the shopping list? Kellie, because they were used in the Sloppy Joe recipe. I got all mine in the freezer this evening, and that Sloppy Joe tasted pretty good when I licked the spoon! Anxious to see how we like all of these. I have never seen chicken gumbo or tomato rice soup at my grocery store. I’m going to check again just to make sure I didn’t overlook them but in case they don’t carry them, what would you suggest I use instead? Do you have any lists like this but for freezer to crock pot. I’d really like to find some simple recipes I could just take out of the freezer before work then through them in the crock pot and when I walk in the door it smells so yummy! Brandy, at lease some of these ARE crockpot – just thaw overnight, then put on to cook in the morning. Please please create more of these plans — they are amazing! Thank you. Great post. I really need to do this. Those printables rock too! We LOVE your freezer meals plans. I spent $55 on 26# of meat, plus limes & root beer for the entire 10 entrees. I could only find one large pork shoulder so I cooked that all at once. The first meal was traditional BBQ on rolls. The second meal was BBQ nachos suggested to me by one of the employees at Trader Joes. Both meals got two thumbs up from the fam. My husband and I did all the prep together; he butterflied the gigantic chicken breasts and ran the vacuum sealer. We actually enjoyed our “kitchen date” and plan to do it again on next week’s Sunday Prep. I just love your blog. Thank you for providing such terrific ideas for restoring our sanity and for saving us time and money! I love these meals! Thank you so much! I’m signed up for Once A Month Meals but your delivery of instructions and recipes and such is much more appealing to me. I appreciate all of the hard work you do to make these. Can’t wait for more! I just made these and am so grateful for this post! I did notice a few things that may be errors or I may have missed something. (1) I didn’t see where a stand/hand mixer was used. (2) It wasn’t very clear that the coleslaw was for the sloppy joes. (3) The mozzarella cheese doesn’t say “for cooking day” (4) For the chicken parmesan it says 15 oz can Italian tomatoes on the shopping list, but on the recipe it calls for 2 cans diced tomatoes (5) The recipes call for 6 cups chicken broth, not 8, (6) I could not find where cayenne pepper is used. I just thought I would mention these things to see if they might need to be fixed. Thanks again! I made these recipes today and noticed the exact same things. It’s fine to have the extra cayenne pepper, cheese, and broth. But I was in a small pinch not having enough tomatoes. Thanks Emily! We will get those corrected ASAP! I made #1 a couple weeks ago, but my husband thought #3 sounded better for our second round. My daughter and I threw these together in an hour last night, and they all look amazing. This has been a game changer for our Sunday preps! Thank you so much for the ideas! Which recipe calls for the sage? Valuable information. Lucky me I found your website by accident, and I’m shocked why this twist of fate did not took place in advance! I bookmarked it.